Editor’s Note: After the game’s original release, this review has been updated following the release of the Nintendo Switch edition, the first two chapters of its three-part DLC known as Secrets of the Maw as well as numerous free updates to all customers which reflects on the overall score, and final verdict. 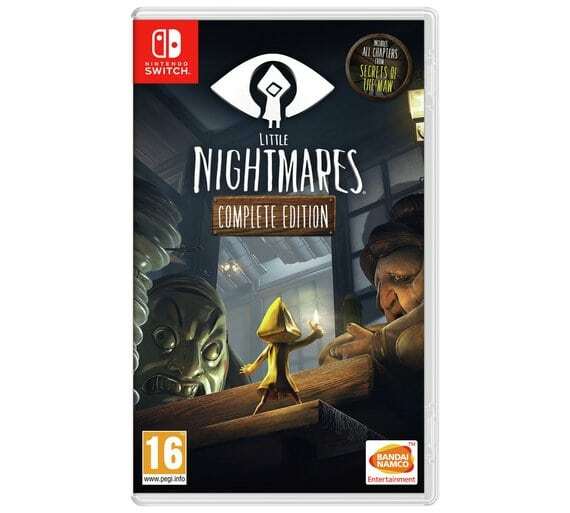 Now available on the Nintendo Switch, Little Nightmares Complete Edition is a dark tale that aims to make you face your childhood fears, and the narration remains very mysterious during the main adventure that lasts about four hours, extended with Secrets of the Maw. If you want a more direct review of the game and its previously released DLC, you can read it below as reviewed on the Xbox One, but this part here focus mainly on the Nintendo Switch port. The game on the Nintendo console plays heavily on the best point of the game, which is its artistic direction. Each environment is beautifully done, with some passages focused on discretion or reflection, while others have you getting chased by a dangerous monster and much more. Added to the musical mood and sound effect of the game, helping you plunge us into a dark world, but I would recommend hooking up some headphones if you’re playing on the go as the console speakers are a bit hushed down. This port on Nintendo Switch is done thanks to Engine Software (who previously worked on porting Monopoly for the handheld console), and while the original runs at a native 1080p, it had to be reduced. Little Nightmares Complete Edition on the Nintendo Switch runs at 720p and 30fps natively when docked, and upscaled in portable mode. This causes the rendering to be a little more blurry than other platforms, but remains solid, with no framerate drops or slowdown to disturb your gameplay. On the other hand, the Nintendo Switch version has some issues with loadings, often taking 25-40 seconds between levels or after each death (which are common). The casual gamers will appreciate the simplicity of the gameplay and the originality of the title, but you should note that this version still raises more questions about the truth of why Six is stuck in this universe, and what will happen to her in the future even if this complete edition includes “The Depths” and “The Hideaway” DLC. Finally, for those of you that have the Pac-Man amiibo, you’ll be able to adorn Six with the Pakku Mask. All in all, if you didn’t play the game yet on either Xbox One, PlayStation 4 or PC, then I would definitely recommend trying this out on the Nintendo Switch. Announced after the release of the game, Secrets of the Maw is a three-part DLC for Little Nightmares, telling the story of a new protagonist of this macabre story, known as the Runaway Kid, similar to one of the non-identifiable children encountered during the main adventure. Less recognizable than Six, the young boy seems to be lost into the setting of this chapter, a bit like the faceless boy from Playdead’s Inside. It all starts when, after a bad dream, our little man wakes up in what appears to be an abandoned dormitory, and is attracted out of bed by a glow. To tell you more would be to spoil the experience of this new chapter call The Depths. Because yes, let’s say it bluntly: you will need at most sixty to eighty minutes to finish this first chapter. Suffice to say that the lifespan makes sense, considering that this fragmented DLC, is priced at only 4$, or $10 if you wish to buy the whole pack. So what’s new in The Depths? For those who have already gone through the five levels of the main game, there’s really nothing new: It’s pretty much a gloomy world in which we help our boy to escape. The artistic direction is as always well done, with once again, an emphasis on the contrast between the protagonist, and the striking dimensions of the environment. Nevertheless, they are not as inspired as those showcase in the original game, and the color palette rarely varies beyond shades of blue, which makes some of the different areas traveled generic and rather empty. Like with the original Tarsier Studios game, the experience is minimalist. The actions of the character are reduced to a minimum in order to accentuate his feeling of being scared and confused in a strange world. The only small novelty is that Six’s lighter is now replaced by a flashlight, serving the same way to light the surroundings, but obviously with an increased range. It is regrettable that this did not lead to a more daring exploitation of the gameplay. If Little Nightmares finally offered little challenge, this chapter will not change the game. In basically 45 minutes, the player is led through various vistas that are without major challenge. It is only in the last part of the game, that you’ll live some small moments of thrills with an antagonist worthy of those encountered in the main game levels. Finally, The Depths is in line with the main game, except that the latter proposed at least various levels and a more sustained pace, especially on its final act. This chapter seems to suffer from the absence of the next two chapters, which are out later on. Having finished The Hideaway, I sincerely find that the production quality has been extended by teaspoon servings but hey, it’s also a way to make the experience last longer. The Hideaway is the equivalent of the first chapter in term of lifespan, with around an hour in total of gameplay. This chapter in some way is less linear than the previous one – The Maw – while still remaining a perfect continuation of the story. Our hero finds himself at the mercy of another antagonist known as the Janitor, and must yet again try to escape, while the game uncover more details about the lore, notably the Nomes. Previously seen on multiple occasions throughout the original games, these innocent looking creatures will be the key to our hero’s escape. Secrets of the Maw’s second chapter has also more of a challenge to it. The stealth phases are more difficult – and not because of bugs – but also puzzles which will require a bit more of brain cells. The overall mood is still impressive and even if the young hero still lack the charisma of Six, I cannot wait to to see how this whole story will end for him in the final chapter this year. On top of all, I got to give it to the team the work done on the soundscape, which is impeccable and has an oppressive eerie vibe to it, especially when the danger is felt. If you’ve played numerous Sony Interactive Entertainment Worldwide Studios’ games like Little Big Planet, then Tarsier Studios is a name you probably heard. Now after numerous games and DLCs for SIE, this small Swedish independent studio finally release their own in-house project thanks to Bandai Namco: Little Nightmares. A cute puzzle platformer that its mysterious mood and artistic genre reminds us of Playdead’s LIMBO or even INSIDE, but is it truly original? Dressed in a yellow raincoat, the little heroine you control in the game is called Six (which the game will never tell you by the way). Little Nightmare is so mysterious, that it will never explain how this poor child ended up inside a suitcase lost in a dark room, or what are those strange little elves that you will meet, or even why there are monstrously deformed adults that want to imprison kids. The only real revelation that will be made during the adventure is linked to the actual environment you’ll be playing in, and that’s just exactly what you would expect from a game that reminds us so much of INSIDE. By ignoring the narration in the strict sense of the word (with no text or dialogue), Little Nightmares is full with mystery, even if it leaves the player perplexed at times, especially at the very start of the adventure, where even simple gameplay mechanics are not even explained. I get that there’s a lot of trial and error in these games, but there’s need to be a bit of explanation, even if it’s just a quick reminder that there’s a control scheme in the menu. If the general lack of clarity, it is never really handicapping, but we finish the adventure with a number of unanswered questions, which is probably in preparation for future content. Fortunately, the game still has a couple of interesting scenario twists, particularly through the theme of greed and hunger. I’ll refrain to say more, as it would spoil the game’s story, but one is for sure: the heavy and dark mood is reinforced by this lack of explanations. The artistic direction fits with the game’s mood perfectly, and even allows itself to display totally incoherent proportions, which help to set even more to the discomforting effect of a nightmare. Ridiculously small, Six regularly crosses by objects far too big for her in real life, but yet too small for the giants whose path she will cross. The impression of evolving in a nightmare is permanent, and it is a feast for the eyes thanks to numerous small design elements. There’s a certain old film grain filter on the scenes, with washed-out colors, as well as volumetric light and other graphic subtleties that reinforce an artistic direction already powerful at the core. The soundtrack compliments the visual art as well, aiming to both charm and worry us, with metal squeaks, floor cracking, mysterious whispers, grunts of giant creatures, childish music… All these sound loops discreetly fill your brain with suspense and get you in the mood without noticing. With such a universe, the gameplay obviously cannot be based on pure action, and like its PlayDead counterparts, Little Nightmares is basically a platforming game, with small puzzles and a few hide-and-seek sections (or stealth if you want) with monstrous creatures. While I’ve mentioned LIMBO and INSIDE so many times, Little Nightmares is different with the addition of a 3D element in the platforming sequences, where you can advance front and back in the scene, instead of a simple left to right sidescrolling mechanics… But this addition is hardly useful and even complicates some passages, as controls lack precision. Little Nightmares is also short in terms of lifespan, which requires roughly three to four hours to be completed, but then again that’s the norm nowadays for a $20 price tag title… But the biggest issues I have with Little Nightmare lies in the more-than-obvious heavy influence of PlayDead’s INSIDE. The mood of the game, its gameplay, even some animations and couple of the game’s important scenes reminds me too much of Playdead’s title, to a point that even GOG.com had a preorder incentive offering INSIDE with Little Nightmares. Little Nightmares was reviewed using an Xbox One digital code of the game provided by Bandai Namco. The game is also available on PlayStation 4 and PC in both digital and retail stores. We don’t discuss review scores with publishers or developers prior to the review being published. Now available on the Nintendo Switch, Little Nightmares is heavily inspired by the work of Playdead, and while it's short even as a Complete Edition with all previously launched DLCs, it's a solid adventure with striking artistic direction and a dark story to tell.